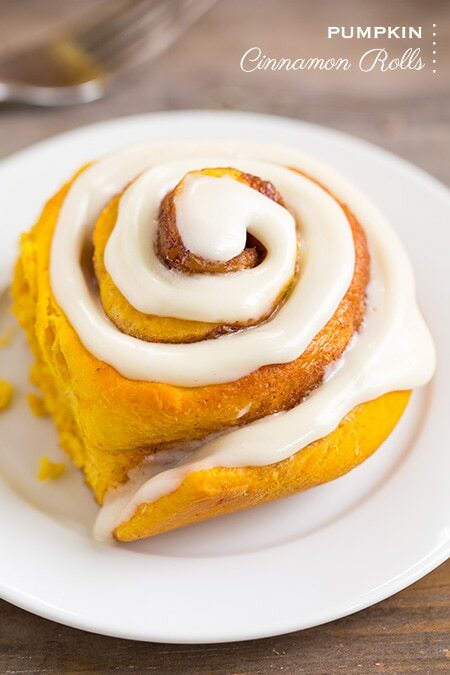 Soft and tender, deliciously flavorful Pumpkin Cinnamon Rolls! These things just melt in your mouth. I mean who could resist? 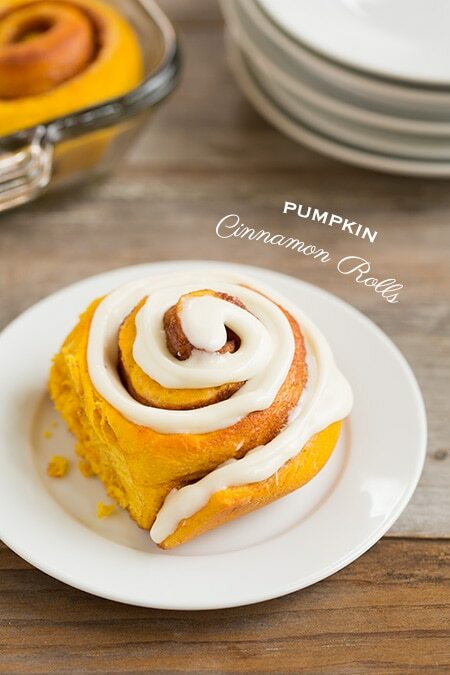 We all love the classic classic cinnamon rolls but pair that with pumpkin and amazing things happen! 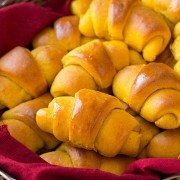 These are perfect for fall and the added pumpkin makes the rolls amazingly moist (in a non-doughy way) and it adds that amazing flavor we can’t get enough of. The added spices are also a wonderful addition to the traditional cinnamon. They enhance it in all the best ways. 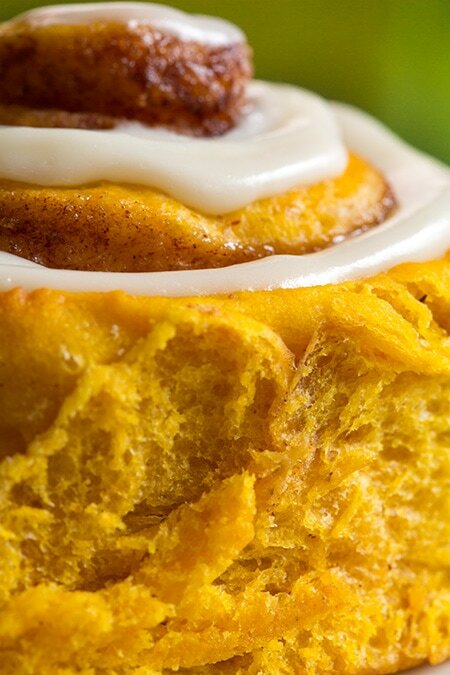 You’ll have a hard time stopping at just one of these soft and sweet, pumpkin cinnamon rolls. They are melt in your mouth delicious especially when they are warm out of the oven. Enjoy! Add yeast to warmed milk in liquid measuring cup and whisk to dissolve. Let rest 5 - 10 minutes. Meanwhile, add sour cream, vegetable oil, egg, 1/3 cup brown sugar and salt to the bowl of electric stand mixer. Add milk mixture. Set stand mixer with whisk attachment and blend mixture to combine. 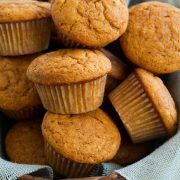 Mix in pumpkin puree, nutmeg, ginger, cloves and vanilla. With mixer set on low speed, slowly add in 2 cups of the flour and blend until combined, then switch to hook attachment and slowly add in remaining 1 1/4 cups flour. Knead mixture until smooth an elastic, about 5 minutes, adding in additional flour as needed to create a soft dough (it should pull away from sides of the bowl and slightly stick to the bottom. It shouldn't stick to a clean fingertip). Transfer to a lightly oiled bowl, cover with plastic wrap and allow to rise in a warm place until double in size (I like to place it in the oven with the light on), about 1 1/2 hours. In a separate small mixing bowl, whisk together 3/4 cup brown sugar and cinnamon set aside. Punch dough down. Roll out onto a clean, lightly floured work surface to about an 18 x 12 inch rectangle. Brush top evenly with 1/4 cup butter and sprinkle with cinnamon sugar mixture and spread into an even layer. Beginning on the long side (the 18-inch side) snuggly roll up to the other end (to the other 18-inch side). Cut into 12 even rolls and transfer to a buttered baking dish (I used a 13 by 9) Cover loosely with plastic wrap and allow to rest in a warm place 40 minutes, preheating oven to 375 during last 10 minutes of rising. Uncover and bake in preheated oven until tops are golden and centers are no longer doughy, about 19 - 23 minutes. Allow to cool slightly. Meanwhile in a mixing bowl, whip cream cheese and butter until fluffy. Blend in vanilla and powdered sugar. Slowly add milk until desired consistency is reached. 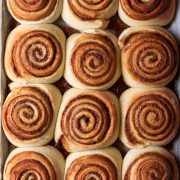 Drizzle or spread over warm rolls. Store in an airtight container (these are best served warm so I recommend rewarming them in the microwave if not served right away, each about 15 - 20 seconds). KarleineJ: Are you using Instant, Fast Acting, or Rapid-Rise Yeast? I’ve had trouble with rolls in the past using the wrong one.